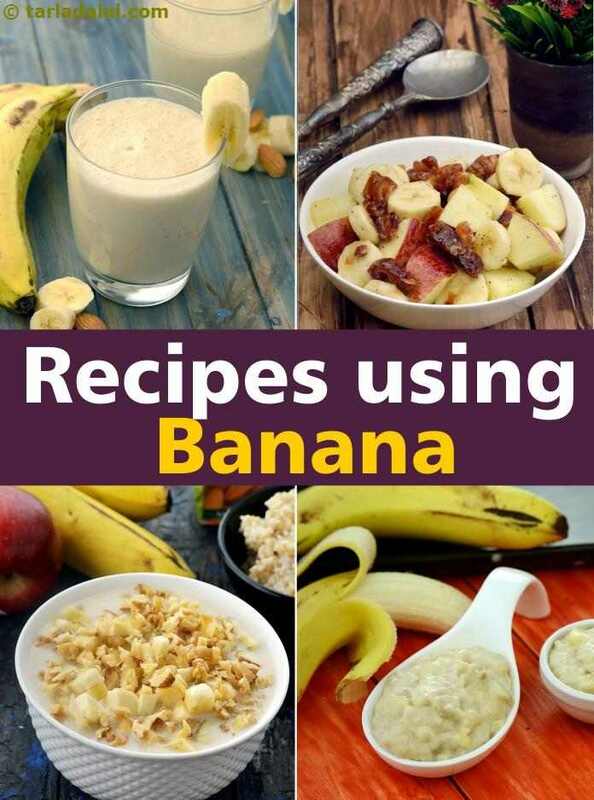 Collection of Banana recipes. Bananas or Kela are sweet, tropical fruits that are now available almost everywhere in the world. With varieties like raw bananas (plaintains) and the yellow bananas, they are not only used as a snack or dessert, but also in regular cooking, especially in India. In India, bananas are not only treated as a fruit or a topping but instead used in making subzis and other traditional desserts. Moreover, even the banana leaves are used for various cooking methods to make pankis or rice cakes since centuries. Gujaratis are known for widespread use of bananas as a substitute for vegetables. Kela Methi nu Shaak is one such example where bitter methi is paired with a sweet banana to create a wonderful contrast of flavors. In case you want to avoid methi, then you can just make Kele ki subzi where banana is sautéed in various spices to create a quick, delicious subzi. Another delicious Gujarati special is oondhiya, which uses bananas as one of the many ingredients to make a flavorsome mixed vegetable shaak. If you are not interested in subzis, there is always Bhatia Kadhi, a kadhi which hails from the bhatia community of Gujarat, a sweet and sour combination made with bananas and curd. A great way to incorporate bananas in flatbreads is to make a Banana Methi Thepla which can be done by simply mashing the bananas and adding them to the dough. Since bananas were easily available throughout the year in South India, recipes using bananas was their go-to. Starting with breakfast, Puttu, a traditional rice and coconut breakfast is always served with sliced bananas. As a subzi, kela is used in Pongal kootu, a mixed vegetable curry cooked with tamarind and dal, which is mostly made during Makar Sankranti. Like the Gujaratis, Mangaloreans also use bananas to make puris, whether it's to be had with a subzi or as a tea-time snack with piping hot tea or coffee. Another tea-time snack is Unni Appam, a sweet, deep fried snack with additional sweetness of jaggery. But the best snack of all, made with bananas, is Yellow banana chips! Originated in Tamil Nadu and Kerala, these crispy, wafer thin, kela chips are now world famous and hard to resist. Not only is the banana fruit used for cooking, the leaves are equally important. Banana leaves have been used in Asian cooking for centuries and they impart a subtle flavor in the food too, and hence are really growing in demand all over the world. Banana Leaf Rice is one such unique recipe where rice cooked with caraway seeds and coconut curry is packed in banana leaf, steamed and then served warm. Paneer Bhapa, a unique Bengali dish of paneer marinated with lemon, coconut and mustard is also cooked inside banana leaf pockets for better flavor infusion. A very common way to use banana leaves is to use them for steaming pancakes whether it is the sweet rice flour pancake orginated in kerala called Ela Adai or the savory Gujarati panki like Corn and Coriander Panki or the green peas panki. An innovative snack using bananas is Banana Dosa, a sweet dosa served warm with a little butter is perfect for kids or adults alike. Or you can even try making Banana Uttapas, sweet and succulent uttapas made with bananas, rice and urad dal. For something on an international note, Thai style deep fried bananas make a fantastic snack. A twist on the classic rosti, Raw banana rosti is a great way to avoid the carbs of the potatoes and still enjoy the same taste and feel of a great rosti! If your way is a sweet way, Baked and Stewed bananas is your way to go. A unique combination of orange flavored bananas is a fruity dream come true! Bananas make a great addition to any kind of desserts, but especially the Indian ones. Bananas and other fruits like apples and pear when stuffed in desserts like ras malai, you get a new and improved Fresh fruits stuffed Rasmalai. The same way you can add bananas to the cooked full fat milk and make a Banana Kulfi. Instead of making the regular, savory raita, adding bananas to the curds will be a pleasant change along with a kick of spice when you make Banana raita. You can also add chopped bananas to a regular sheera, or better yet, a healthy jowar sheera to take it up a notch to get Jowar Banana Sheera. We hope you enjoy our Banana Recipe Colletion given below and would love to hear your comments. This duo of bananas and yoghurt will provide for plenty of calcium and energy in your diet which is helpful throughout your 9 months of pregnancy. Be it early morning or mid afternoon, this refresher is sure to lift your spirits up. The banana oats smoothie, as you might have figured out already, is an intelligent choice for breakfast! the use of bananas, oats, flax seeds, curds and honey (instead of sugar) marks up the nutrition quotient of this recipe remarkably. An interesting sweet treat, especially for children! these banana dosas taste very nice when served warm with a dollop of butter. Make small dosas so that your child can easily eat them on his/her own. A low-calorie, anytime and all-time favourite. Let us minus the oil and make a healthy version in the microwave, so that your fasting is truly fat free.